Unfortunately, his presence here as the film’s director gives the media and critics that hook. Indeed, it made me decidedly unenthusiastic about seeing the film, since I was really not interested in a retelling of the Andrew Wakefield controversy. But, because of the nasty, unprecedented, campaign of censorship against it, I did see it, and was surprised and pleased to see that it is not about him; it’s about Dr. William Thompson and his evidence regarding the CDC study. It’s a careful recounting of that prima facie evidence of deliberate deception, told with sharp, gut-wrenching attention to the plight of autism-affected families. It echoes many of the concerns of another documentary, which DeNiro mentions in his interviews, and which Wakefield has nothing to do with, called Trace Amounts. But you have to see the movie to know that. Speaking on the basis of my own reluctance, I say: Don’t let Wakefield scare you off. Rosenthal, meanwhile, makes a point of answering a question nobody asked her: “It wasn’t our sponsors or donors that were threatening to pull out of the festival. It was our filmmakers.” Later in the interview, DeNiro seems to second this. However, Penny Lane’s open letter, the most publicized filmmaker intervention, makes no such threat. If she didn’t, who did? 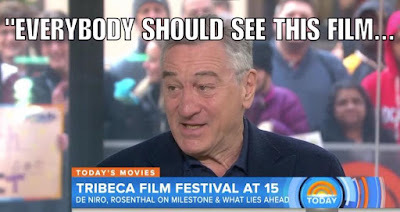 I want—the world needs—to see the list of courageous filmmakers, who must be proud of their pro-free- but anti-dangerous-speech stance, and who threatened Robert DeNiro with pulling their films from his festival. But it does become a First Amendment issue, when, following on Penny and the Round-Earthers’ victory at Tribeca, the film they targeted is also pulled from the WorldFest Festival in Houston, which bills itself as “the oldest Independent Film & Video Festival in the World.” This time, there’s no tale about the revolt of the filmmakers. This time, the festival’s organizer received “very threatening calls … from high Houston Government officials (the first and only time they have ever called in 49 years) … Heavy handed censorship, to say the least… they both threatened severe action against the festival if we showed it, so it is out. Their actions would have cost us more than $100,000 in grants….There are some very powerful forces against this project.” As the local news reported it: “Ffor the first time in nearly half a century an elected government leader [Mayor Sylvester Turner] has intervened to prevent a scheduled film from being screened.” Truly a momentous and significant moment in American film history. Ubiquitous private and public censorship, and nary a word of objection from the liberal cultural elite. It takes very powerful force indeed to demand this kind of instant, absolute compliance from Tribeca to Houston. And it’s not the union of safe-speech artists—not Penny’s crew, but Jane’s—which wields it. Are liberals and lefties really comfortable ignoring, accepting, or even applauding what’s going on here? Do they really want to embrace the discourse of “There is no debate!” on this subject? Can the most culturally influential of them, so enthusiastically, with such militant, “scientific” self-righteousness, discipline their friends and colleagues with: “Shut up! I will not permit any discussion of the subject. It is literally beyond question by rational minds.”? Can they seriously issue a mandate that we all must reject—and, indeed, actively shut down—any critical discussion, any cultural expression, of the potential risks of any medication called a vaccine, as if it were equivalent to discussing whether the earth is flat? Can they also mandate that we regard parents, doctors and scientists who do raise doubts about any of the scores of concoctions of pathogens and adjuvants injected into the bloodstreams of their children as some combination of stupid, anti-scientific, and—by some bizarre leap of illogic—reactionary? Somehow liberal-minded folks, who are so sensitive to corporate (including pharmaceutical company) greed and corporate-government collusion, are completely buying into the idea that those concerns should never be raised when talking about one particular corporate pharmaceutical product. That’s why it’s really OK—literally beyond question of rational minds—that vaccines are not subject to the same safety testing as other pharmaceuticals; it is OK that there is no testing of the synergistic contraindications of administering multiple vaccines at the same time; It is OK that, pace Hillary, it is vaccines, not guns, that are the only product in America whose manufacturers are fully exempted by law from responsibility for the harmful effects of their products, no matter how defective their design. And it means nothing—not to be discussed—that the lead author of the CDC paper used to disprove any autism-MMR link now says, with documentary evidence, that the report was essentially fraudulent: “Oh my God, I did not believe that we did what we did, but we did. It’s all there… This is the lowest point in my career, that I went along with that paper.” Move along. Nothing to see here. Regarding the specific issue of CDC’s treatment of the MMR-autism link that’s the subject of the movie, there are a few suggestions that I think would be helpful. First of all, Dr. Thompson, who still works for the CDC and is represented by whistleblower attorneys, has been asking for two years to testify before Congress. For some reason, somebody has avoided this. He should be allowed to do testify and present his evidence under public scrutiny, as should those he has charged with manipulating and destroying evidence. Those would include Dr. Julie Gerberding, former head of the CDC, to whom Thompson wrote a letter in 2004, informing her of “problematic” findings regarding an MMR-autism link. Dr. Gerberding left the CDC in 2009 to become the president of the $5-billion-a-year Vaccine Division of Merck, which makes the largest number of CDC-recommend/mandated vaccines, including MMR. Dr. Gerberding recently sold about half of her Merck stock for $2.3 million, so she should be able to take the time off to testify. 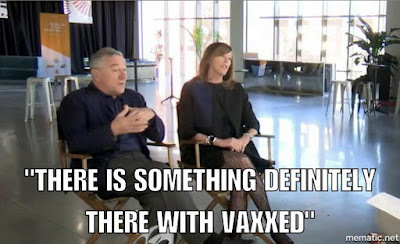 2 Quotes from: Timeline of Events in the #CDCwhistleblower Scandal, The Thompson Transcripts: Shocking Revelations by the CDC Whistleblower – The Thinking Moms’ Revolution, and the documentary film Trace Amounts. 3 Before Vaxxed came out, I was in the process of writing a long post on vaccinations, with the adamant intention of never mentioning Andrew Wakefiedl. The Wakefield story revolves around that 1998 Lancet article, which (you might be surprised to know) did not say that the MMR vaccine caused autism, but suggested the matter be studied further. The Lancet later retracted the paper after it was attacked by journalist Brian Deer. The whole affair is much more complicated than the standard media narrative has it, and it would take a long exegesis to do it justice, which I have no interest in doing. The most relevant piece in this context is Vaxxed producer Del Bigtree’s statement on Wakefield. Google will get you everything else.